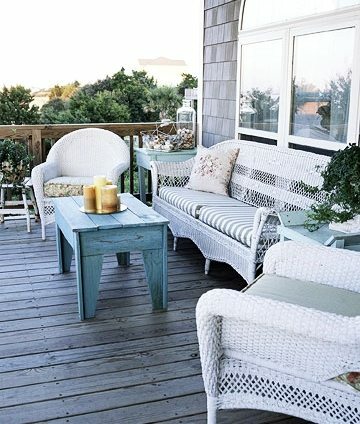 Located on Emerald Isle, North Carolina, this gorgeous beach cottage is filled with recycled and restyled furniture bargains, shells, and other treasures from the sea. With its casual elegance and blue and white theme, the cottage, featured in Better Homes and Gardens, has a bit of a French country feel. So charming! And all the cool furniture finds that have been recycled and restored are so inspiring. The coffee table, for example, had a previous life as a piano bench. They unified all the furniture bargains with a coat of white paint (simple trick to pull together different pieces). I think the mantel headboard, laden with shells, is quite spectacular and original. And even though the owners display their shells nearly everywhere, in vases, stick them around mirrors, perch them on windowsills, etc., the displays are so well composed that you don’t get the feeling of too much at all. Quite the opposite actually. 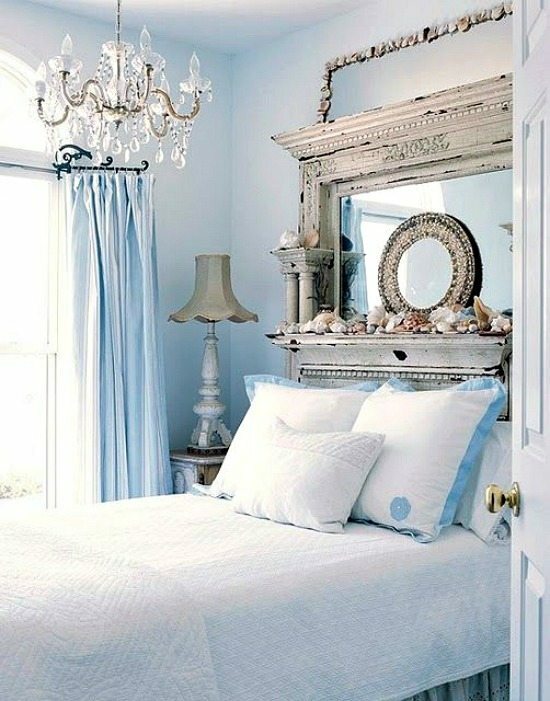 I adore all the pretty seashell vignettes! Even out on the divine porch (on the side table) you can spot a nicely styled arrangement of shells in a large vase and wire basket. They mastered the art of seashell “vignetting”. 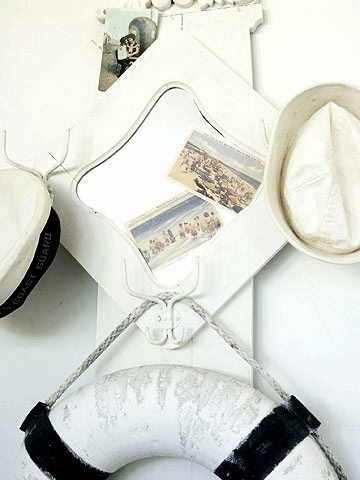 You can find the same motto of recycle and restyle in this Shabby Chic Beach Cottage in Florida. Absolutely LOVE this classic romantic spin you put on the traditional beach home. I might use a few of these ideas in my Outer Banks vacation rental home, myself! Thanks for sharing!